Dressing for the weather isn’t as difficult as some make it seem. And no, you don’t need a whole closet full of gear! A few items will get the job done. Learning how to layer clothing for all weather conditions is easy when you know how to do it properly. Keep reading below to see how it’s done. It wasn’t until recently I learned how to layer clothing for all weather conditions. Growing up on a farm I was always outside, but oddly enough I was never taught how to dress appropriate for the weather. The winter consisted of wearing a big heavy coat, t-shirt or long sleeve underneath, snow pants with jeans underneath, heavy boots, etc. In the Summer it was shorts and t-shirt; Spring and Fall a mix of everything. All my clothes and socks were made of cotton, which is awful. GO Outdoors has put together a great article and video about the concept of layering. 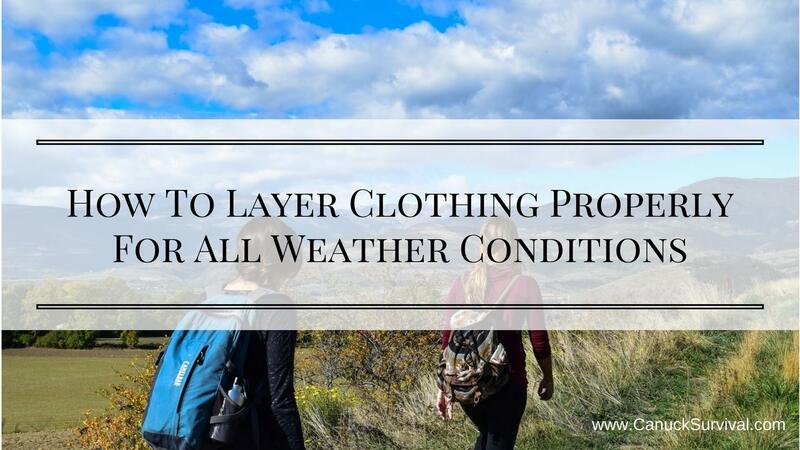 Most information I’ve found elsewhere simply covers what layering is and the difference in fabrics, but not so much how to layer clothing for all weather conditions. Watch GO Outdoors video below and consult the simple chart I’ve created below so you can layer correctly for your next outdoor adventure. In more extreme conditions, I’m talking arctic storms and summit mountaineering, you may need to add a fourth later such as an 800+ down filled jacket like the Patagonia Mens Down Sweater Jacket. This is perfect to keep you warm by putting it under or even over all your layers. Also known as the next to skin layer. It should be against your skin and allow full range of motion. Purpose is to wick moisture/sweat from your skin to regulate body temperature. Great on its own for aerobic activity or warm days. DO NOT USE COTTON. Cotton soaks up sweat and stays wet, this is not good. Merino wool is the best to use, although it’s expensive and not as durable as synthetics, it’s wearable in all seasons and doesn’t stink! Smartwool and Icebreaker are the top brands. Shop Base Layers on Amazon! This second layer helps trap in body heat and wick more sweat. Could be thin, mid-weight, or heavy-weight fleece. The outdoor temperatures and your activity level will determine the weight/warmth you need. On nice days the mid layer will be your outer layer. Popular choices include the Patagonia R2 and the Nano Puff Jacket for added warmth. Protects against wind, rain, snow, etc. A jacket with vents will prevent you from getting swampy under the waterproof shell. Lightweight and packable is best for versatility. Popular choices are the Marmot Precip and Outdoor Research Helium II. Shop Waterproof Shells on Amazon! Step 1: Look outside or look up the forecast for the day(s) you’ll be outside. Step 2: Dress accordingly using the handy chart below. Rainy and warm Baselayer + wind/waterproof outer shell for protection from rain and wind. With this new found information you’re ready to take on the world no matter the weather! Leave a comment below on your favourite piece of outdoor gear and thanks for reading! This was actually very informative. I went to school with a bunch of outdoor enthusiasts and you think I would remember something about proper layering. I guess not. This was a very good refresher. Thank you very much, I’m glad I could help!